A highly impaired, effluent dominated stream downstream of a wastewater treatment plant. Photo by Dave Walker. Last Monday I discussed how tolerance values are assigned to aquatic insects so that water resource managers and scientists can use insects as indicators of water quality. While simply knowing the tolerance value of an invertebrate can tell you something about that animal and where it is likely to live, combining the tolerance values of a whole bunch of invertebrates can tell you some pretty profound things about the body of water in which you found them. 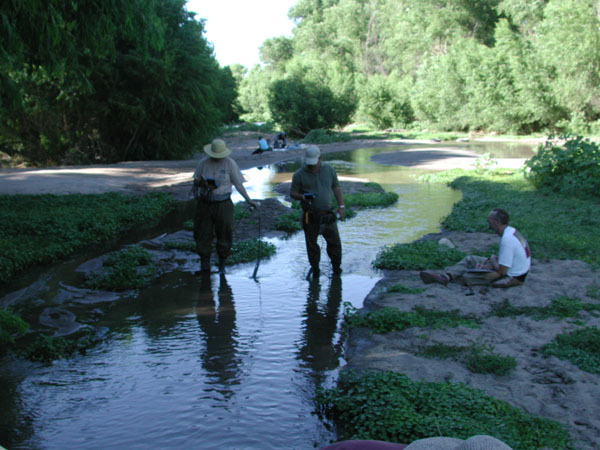 Today I’m going to walk you through a large study that I did with my former employer, one in which we examined the aquatic macroinvertebrates in five effluent dominated streams in Arizona, to show you how tolerance values can be used to determine the water quality in a body of water. Arizona isn’t known for having tons of water all over the place. We have a lot of people in some areas and a whole lot of agriculture, so the demands for water are high. As urban and agricultural uses grow, the amount of total available water will decrease until there is very little left. Water resource managers are thus looking to other sources of water to meet the needs of Arizonans and our aquatic wildlife and sport fish. One possible source of water is effluent. It’s possible that many of Arizona’s aquatic animals, especially fish, will depend on effluent dominated waters (EDWs) for survival in the future. Me recording data during a sampling trip to an EDW. Photo by Dave Walker. 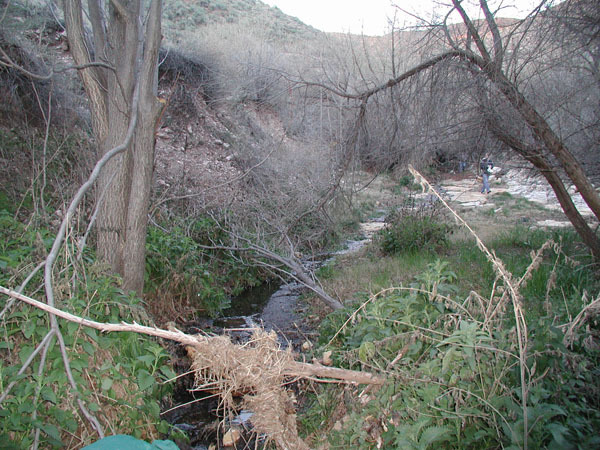 Soon after I started grad school, the Arizona Department of Environmental Quality (ADEQ) became interested in classifying and comparing the macroinvertebrate assemblages of five Arizona EDWs to determine a) the water quality at the outfall from the waste water treatment plant (WWTP) and further downstream and b) whether they represented viable habitat for Arizona’s aquatic organisms. They gave a grant to my former employer, who hired several students to help, including me. All of us spent many hours working in some really awful water collecting insects, measuring basic water chemistry, collecting water and algae samples, and measuring the physical characteristics of the stream. We collected from two sites in each of five EDWs, once during the winter and again during the summer. Back at the lab, I directed a team of people who sifted through the enormous samples, removed all the macroinvertebrates, and then handed them over to me to ID. Once I had everything identified to genus and counted, I calculated the diversity and the Hilsenhoff biotic index (HBI) for each site during the winter and summer. Pollution levels according to the Hilsenhoff Biotic Index. Click to make bigger! From Hilsenhoff 1987. For the project I was involved with, I calculated the HBI for each site for the five different EDWs. I’m not going to name the exact streams so I don’t end up getting sued (one particular WWTP wasn’t so thrilled about what we said about their effluent…), but here’s what we learned. First, the WWTPs with the better treatment processes had lower HBI’s than the ones with lower quality treatments. For example, in the best WWTP, water is treated using extended aeration, activated sludge, secondary clarification, and ultraviolet disinfection. The average HBI for all sites and dates combined for this site was 7.23. At the worst WWTP, treatment consists of filtering out the solids, running the water through biofilters to remove nitrogen, chlorinating and de-chlorinating the water, and then dumping it into the stream. From another couple of studies I worked on, I know that the water coming out of this WWTP is full of pharmaceutical products, flame and fire retardants, and other chemicals – and it smells terrible too. The average HBI for this site was 9.75, which is just about as high as it gets! Sampling at an EDW in southern AZ. Photo by Dave Walker. There were also some overall trends in the HBI values we calculated for each site and date. The HBI’s were usually higher near the outfall than further downstream, suggesting that the streambed is acting like a filter or the plants are absorbing pollutants from the streams and improving the water quality as it moves downstream. For example, in the stream below one of the high quality WWTP’s, the HBI at the outfall was 7.5 but dropped to 6.9 further down. Also, the HBIs were higher in the summer than the winter, 8.4 and 7.5 respectively in one stream. The reasons behind these seasonal shifts are complex, but the dissolved oxygen levels in the water played a big role. Generally, things with high tolerance values tend to be able to survive in much lower oxygen environments than things with low tolerance values, and oxygen levels decrease as water temperature increases. Thus, invertebrates with tolerance values around 6 were probably just getting by in the winter and couldn’t survive at all in the summer, driving the HBI up during the hot part of the year. The HBI’s of the five effluent dominated streams ranged from 6.5 at a downstream site in the winter at the best WWTP to 9.8 at a downstream site in the summer at the worst WWTP. Notice that with the exception of the one instance of an 6.5 HBI that falls into the “fair” category, these streams suffer from extensive organic pollution. One site earned the HBI of 9.8. Indeed, we found only three species at that site on that date: bloodworms, drain flies, and sludge worms. Sounds appetizing doesn’t it? This EDW looks nice, but it had some pretty nasty water in it. Photo by Dave Walker. 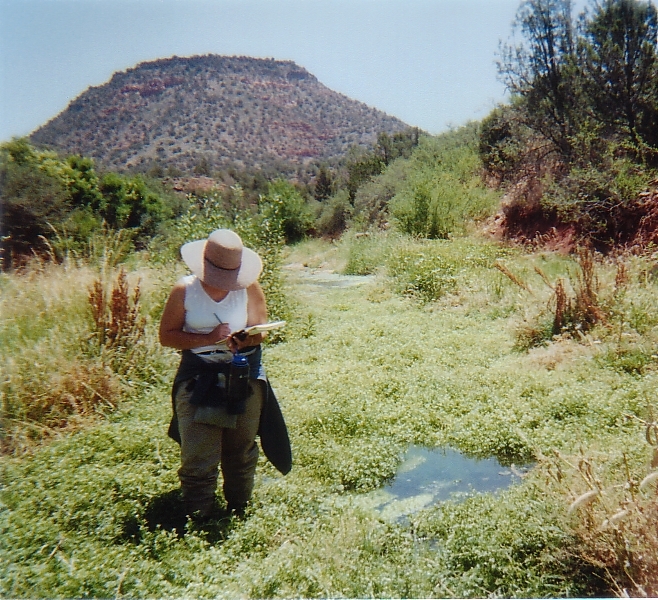 In the end, the HBI values (along with the diversity index we used and our statistics) led us to one undeniable conclusion: none of the EDWs in Arizona are particularly good habitat for aquatic insects. The oxygen levels are too low and the nutrient and chemical content too high for most macroinvertebrates. Fish certainly aren’t going to be able to survive in this water over the long term! 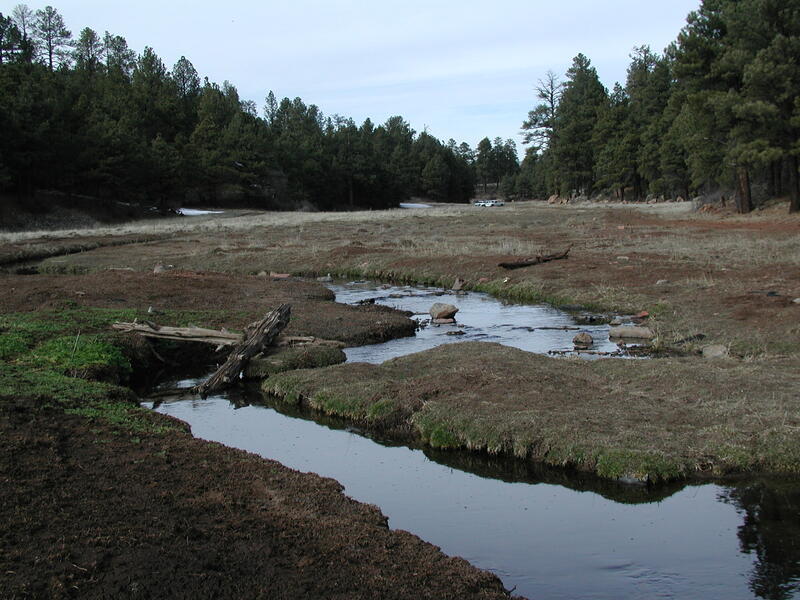 In our report we stated that effluent, at least as it is currently treated, is not of sufficient quality to support habitat for most of Arizona’s aquatic organisms and that improved treatment is the only way to make effluent useful for this purpose. A disappointing recommendation for the water resource managers I think, but it was obvious to anyone who pulled giant handfuls of bloodworms out of a rank, hot, sandy stream when it was 110 degrees outside that this water is far from clean. In fact, several of the WWTPs recommend that you wash your skin with potable water and soap if you are exposed to effluent. I’m continuing with the water quality and macroinvertebrate theme next week. Hope you’ll check back! Hilsenhoff, W.L. 1987. An improved biotic index of organic stream pollution. Great Lakes Entomol. 20:31-39. Am very glad and thankful to have read this article about HBI, am working on macroinvertebrates in river systems in Mindanao so this information is very usable. So glad I could share something useful with you!